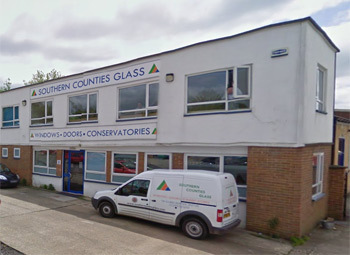 Southern Counties Glass started life in Crawley as part of the former Southern Counties Garages in Ifield Road in the 1930's. Car windscreens were then cut from sheet glass and, with Crawley being designated as one of the satellite towns under the Atlee governments New Towns Act, there was an opportunity to move into general glass and glazing with the huge post war building boom. The business became a Limited Company in 1952 and moved its location to West Street in Crawley. The birth of Crawley new town offered opportunities for those with the know-how to succeed. One such man was Leslie Doughty, founder of Southern Counties Glass. Read more on the Crawley Observer website. In 1960 the business moved to larger works in East Park Crawley. Having acquired a glazing business in Horsham, it sold its Crawley premises and moved that activity to a workshop at Holmbush Potteries on the Crawley outskirts. Over the years the family-owned business has acquired a lasting reputation for good quality, reliability and excellent customer service. Continuing its skills in all types of glazing and glass processing, it was an early entrant into the UPVC window, conservatory and door market, but avoided the door step and pressure selling of many of its competitors, believing that a potential customer required from Southern Counties a full understanding of their requirements, a quotation for a product and service that was of a high standard and competitive. In 1989 the company decided to consolidate its activities in the Horsham Springfield Road premises. By 2003 its work output resulted in these became too congested, and it started to move to its current premises in Foundry Close. It's Executive and major shareholder, explains "our good reputation results from longevity and experience, principally in the many years of knowledge accumulated in the business by our staff. Our Managing Director, started in the business as an apprentice in 1984 and many of his working colleagues have been in our business for twenty five years and longer". In 2003 it relocated and consolidated its business activities into larger premises in Foundry Close, Horsham, the current centre for its administration, sales, showroom, workshops and manufacturing activities. Our long and continuous trading history gives our guarantees real meaning and comfort to our customers. 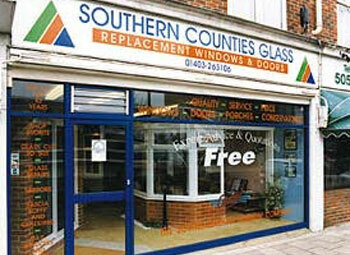 Southern Counties glass celebrated 60 years of continuous trading in 2012. Today it has become a specialist in many non-standard glazing products, including splashbacks (in effect painted toughened glass cut to fit apertures in kitchens, shower rooms, in fact any application where tiling would otherwise be used), glass balustrades, swimming pool surrounds, integral sealed units with venetian blinds, shower screens, leaded lights, glass worktops and many others. In 2013 the business acquired the adjacent workshop unit to cater for further expansion. The staff have been Southern Counties' greatest asset, adopting and deploying new skills as the demands of, and markets served by, the business have changed. A majority have worked for Southern Counties for over 20 years.